I am out of office again starting Thuesday August 25 up to Friday. I am in Kratie conducting field work. It is highly uncertain whether or not I will have access to the internet. I assume that I am back on Friday, but most likely only for very few days before I leave to Mondulkiri again to continue field work. I am in Rattanakiri again and not easily available via email right not. I have spend about 5 days here and travel to Stung Treng Province tonight. 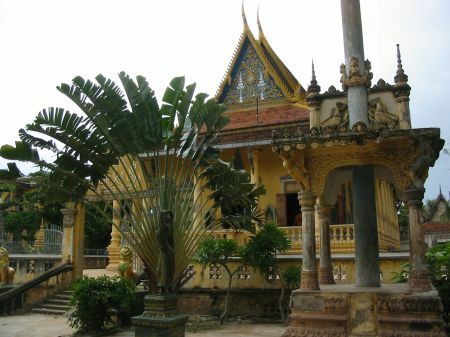 After that I will return to Phnom Penh, most likely on Friday. 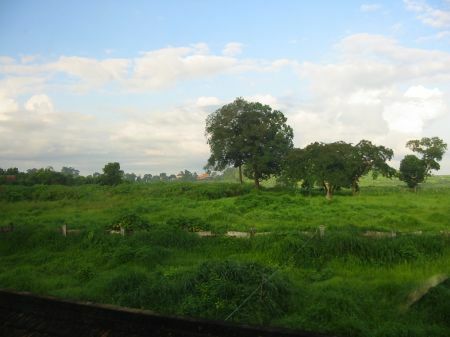 Next week I intend to travel to Mondulkiri Kraties Province. Today is Sunday. I rented the motor bike for the entire weekend and wanted to go to Phnom Chisor (Phnom Chissor, Phnom Chi Sou )today, after I failed to find it yesterday. And I managed to persuade the tourist student to give me company. We decided to go with two motos, both the big one and the smaller one he uses for moto services. We started after breakfast at about ten am. He told me that he never rode a big moto before. I showed him on the way how to drive the big moto but he preferred to first go to Phnom Chiso and than practice riding it. This is a medium sized temple which we reached after we went about 40 km south on the national road number two. I though this is a beautiful temple. I spend some time taking pictures but I did not see anybody. Only two dogs. Today is Saturday. I had found a possibility to rent a moto without handing in my passport and wanted to make up for the previous weekend. After an extensive breakfast including the weekend edition of the Cambodia Daily I went to â€˜lucky! lucky!â€™, the Chinese motorcycle rental service. This is what I got this time. I thought this is good value for $8 per day. Cambodian Prime Minister Hun Sen and his ruling Cambodian People’s Party (CPP) has won an overall majority of the popular vote in the country’s general election. The Cambodian electoral commission said that Hun Sen’s party received 2.45 million votes in last month’s poll – just over 40% of the vote. However the major upset was the opposition Sam Rainsy Party (SRP) polling 1.3 million votes and overtaking the royalist Funcinpec as the main opposition party in Cambodia. No party managed to gain the required two-thirds of votes needed to control Cambodia’s national assembly. And under Cambodia’s complex proportional representation system, the votes must be translated into the number of seats that each party will be allocated in the 123-member National Assembly before there is any formal declaration of the winner. A spokesman for the electoral commission said the seat allocation will probably announced between 14 August and 6 September, the Associated Press news agency reports. Hun Sen has vowed to stay in power even if he cannot find coalition partners to govern with. The BBC’s Tony Cheng says that negotiations are most likely under way to forge alliances needed. Sam Rainsy has previously said that he would never join a government with Hun Sen. Although there is a possibility his party may join Funcinpec, previous attempts have ended acrimoniously, our correspondent adds. Both opposition parties expressed dissatisfaction with the way the poll was conducted, but say they will make official legal challenges before calling for street protests. Uncertainty in Cambodia’s last general election in 1998 led to street protests and violence in which several people were killed. The following article is what I read in todayâ€™s newspaper. I found this to be very serious. The article indicates that CPP officials are recruiting activists (â€œstrongly built bodiesâ€�) in Kandal province (which is what surrounds the capital), offering them almost 9 dollars (which is a fortune for villagers in Cambodia) to come to Phnom Penh and demonstrate in support of Hun Sen. Similar demonstrations after previous elections clashed with opposition protests, involved grenades and left many people death. Those guys came with bamboo sticks furnished with nails to make sure the message is understood. The message is that Hun Sen remains Prime Minister and any attempt to protest against him will be violently suppressed. This is scary enough. However, the article indicates that demonstrators will gather at the Monument of Independence and at the Ministry of Interior. This would be sort of uncomfortable for me, since the Monument of Independence is close to where I live and the Ministry of Interior is actually where I work. And what is in between is my way to work. At the Ministry of Interior it is very obvious since the election that security measures have been tightened. In addition to the usual (low wage) police members of the so-called Flying Tigers unit of the military police patrol on and around the compound and guard the gates. They are equipped with strong motor bikes (Honda Nighthawk). Two officers are sitting on one bike, both have sticks and the backseat guy got an AK 47. I took the following picture shortly after the election almost two weeks ago. This is on the compound of the Ministry of Interior and I was kind of skeptical whether or not I should put this online. On the parking spot are some motor bikes of the â€œFlying Tigersâ€�. Today there are six police trucks with officers waiting on standby. I actually went with our project driver to those officers at the gate to ask whether I could take a picture of them on their motorbike. Of course I was ready to give them money. However, they were not very friendly and refused. In addition I cannot but mention that what I keep hearing and reading regularly is the opposite of what constitutes â€œfree and fairâ€� elections. At the same time particularly international observers have announced preliminary results indicating that the election was more or less exactly that: free and fair. 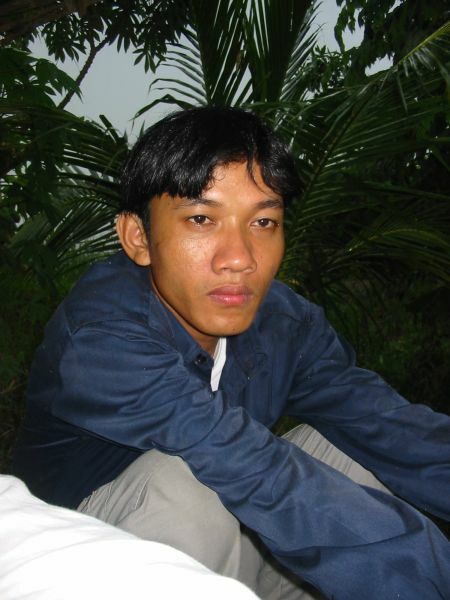 I want to stress that anybody I meet, both Cambodians and expatriates, appears to believe that the election was in fact quite the opposite of any meaningful standard of â€œfree and fairâ€�. However, I hope those election observers stay a bit longer to observe how the election result gets implemented. Garment workers troubled by rumors of imminent political unrest and street fighting demanded an early pay day this week, while teacher and worker unions reported that CPP officials have demanded their signatures on petitions endorsing the preliminary election results. 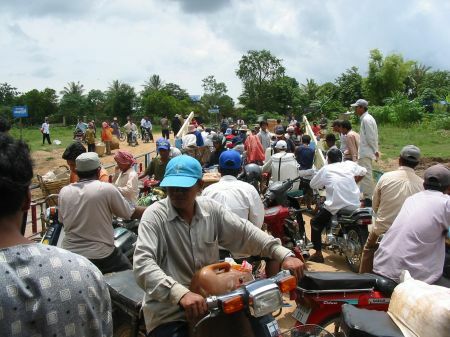 Cambodian Labor Union Federation President Som Aum on Wednesday said his members want early salary disbursements to ensure financial security over the weekend because workers are uneasy that politically stoked fighting could erupt. He said workers will strike at two factories on Friday if managers do not pay their wages. Coalition of Cambodian Apparel Workers Democratic Union President Chhorn Sokha said Wednesday she would consider striking, as union affiliates from 22 factories have demanded salaries but have not been paid. The Labor Ministry advised factories to pay workers earlier than planned to ease tension stemming from rumored fighting, said Labor Ministry spokesman Ker Soksidney. But Garment Manufacturers Association in Cambodia Deputy Secretary General David Van said factories may not meet the demand due to complicated overseas money wiring services. CPP activists armed with slingshots are prepared to enter Phnom Penh today or Friday to support Prime Minister Hun Senâ€™s leadership in the next government, said Kandal provinceâ€™s Koh Thom district Deputy Governor Keo Vibol. Keo Vibol, a Funcinpec member, and local Sam Rainsy Party official Hay Lork said CPP district Governor Mao So ordered CPP commune chiefs to recruit 10 â€œstrongly built bodiesâ€� from each village. Activists were offered 35.000 riel (about $ 8.75) to gather at the Interior Ministry and Independence Monument, Keo Vibol said. Mao So would not confirm whether trucks were ready to enter the city. â€œI donâ€™t have any plan yet, but if the two political party activists hold a demonstration to oust Prime Minister Hun Sen, I will gather my forces against them,â€� he said. To garner workersâ€™ support for the CPP, Labor Ministry Department Secretary General Oum Mean allegedly asked union leaders to sign a petition endorsing the election last week. Som Aum, Chhorn Sokha and National Independent Federation Textile Union of Cambodia President Morm Nhim said they were called to Oum Meanâ€™s department July 28 to sign a petition supporting the election results. All three said they refused to sign. â€œWhat ever political party will win the election, if the local and international election observers announce it is acceptable, I will support the results. But I wonâ€™t sign the petition,â€� Chhron Sakha said. Oum Mean said he did not know about the petition. 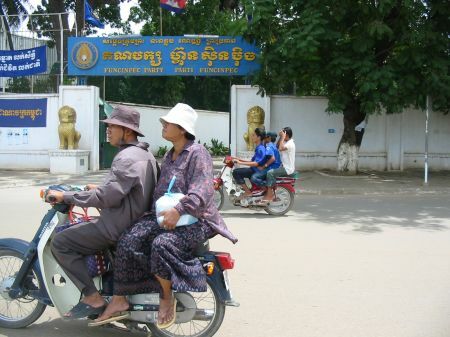 Rong Chhun, Cambodian Independent Teachers Association president, said last week principals in nine schools in Phnom Penh pressured teachers to attend political meetings, where they were forced to fingerprint petitions endorsing the CPPâ€™s election victory. CPP Education Ministry Secretary of State Im Sethy said school principals may be pressuring teachers to join the CPP, but dismissed Ron Chhunâ€™s claims of forced party endorsements. This is Sunday. 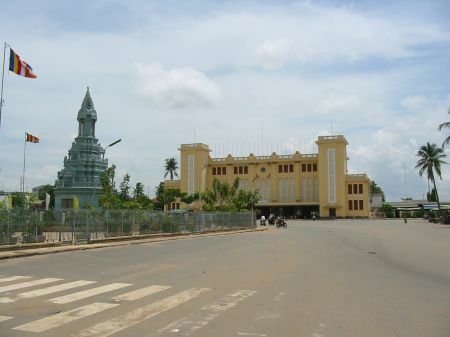 Initially the plan was to go with the moto driver/tourism student to Kampot, which is almost 200 km from Phnom Penh at the sea. This would have been a challenging thing to do on one day, but challenges are what we were looking for anyway. However, the plan did not materialize. I gave my passport to the headquarter for visa extension and it is currently with I do not know which corrupt ministry. I knew that â€˜lucky! lucky!â€™, the Chinese company where I usually rent a moto, does require its customers to leave their passports with them as some sort of security. However, when I came here last time they accepted my ID card and I had no reason to believe they would not do so this time. However, they did not accept it. I assume this is sort of related to the election. I read in the newspaper that many moto rental businesses have put their moto to save places. They are afraid that they loose their assets as soon as post-election riots start. This is exactly what happened after the last election. I realized that most of â€˜lucky! lucky!â€™s motos are in fact not in the shop. I tried to convince them to give me a moto but I failed. So we tried several things, including trying to get my passport from the headquarter, which failed, too. It was almost lunchtime when we had to face the fact that we would not get motos today. 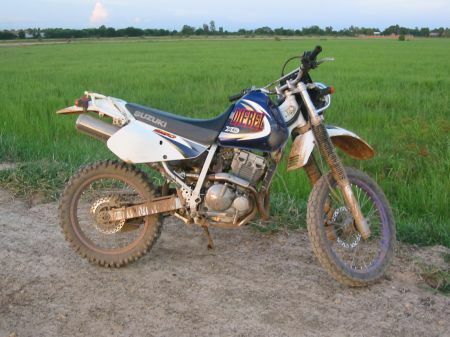 However, my co-traveler got a moto, which is however not a heavy duty one. Due to that and the fact that halve of the day was already over we had to settle for something less challenging than Kampot. 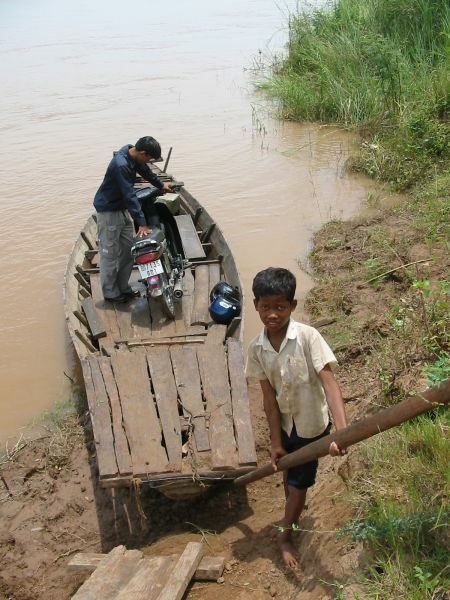 So we decided to visit the Mekong Islands. 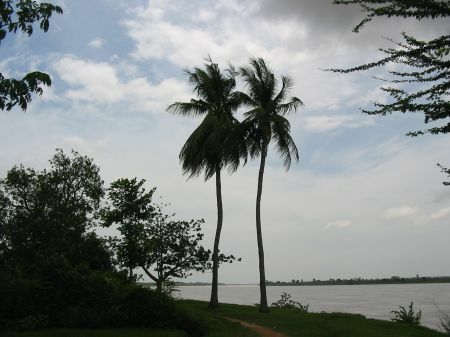 This is only a few kilometer to the northeast from Phnom Penh. I took the following picture when we passed the so-called Japanese Bridge in the north of the city, close to the French Embassy and Funcinpec headquarters. 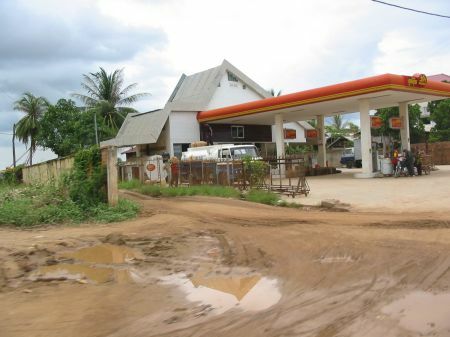 This is another petrol station of the notorious company Sokimex. Although this is outside Phnom Penh they seem to be concerned about riots. 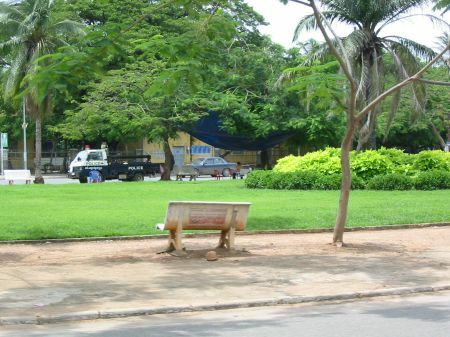 Those fences in front of the truck can be quickly employed to prevent demonstrators from entering. I observed that any Sokimex station is secured with those fences during the night. 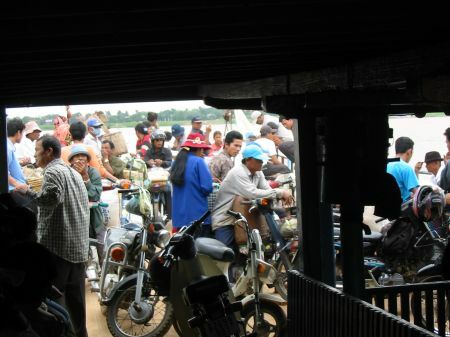 This is the place were the ferry to the Mekong Islands leaves. 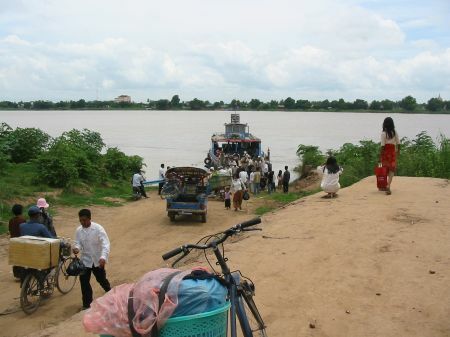 It is only about 15 km from Phnom Penh, shortly before one reaches Khady Chah. I have seen those large wooden boats very often. Mostly they seem to be in use to transport timber and other agricultural and forest products from the provinces to the capital. Most of those people seem to live on one of the islands. 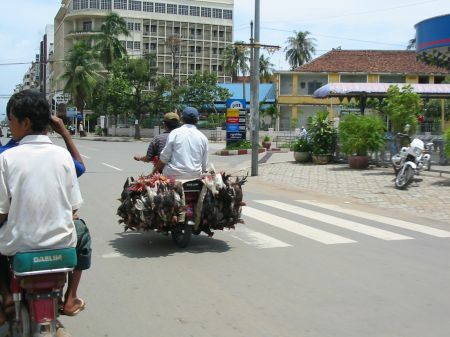 I assume they went with some goods to the market in Phnom Penh in the morning and am on their way back home. This is when the ferry arrives at the island. There is some turbulence when passengers try to leave the ferry while others try to get on. This is how the road looks most of the time. Of course we found a pagoda, too. I got the impression that foreigners do not come here very often. Those youngsters seemed to be pretty amazed just by my sight. Much of those islands seem to be covered with plantations of mostly bananas and papaya. I heard those farmers can achieve a good price on the urban market particularly with papaya. This is when a short shower of rain hits us. However, after few minutes it is over. This island was rather small and we started to look for the next one. We found this guy who offered to give us a lift to the other bank. We kept driving for some time. 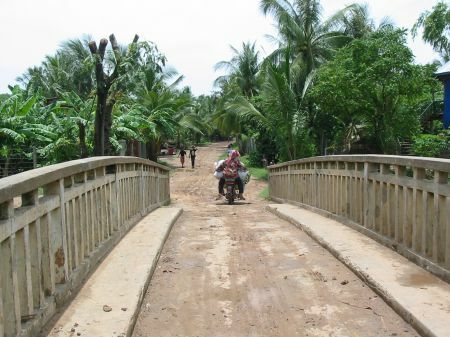 However, after we passed a small bridge the road turned very muddy. 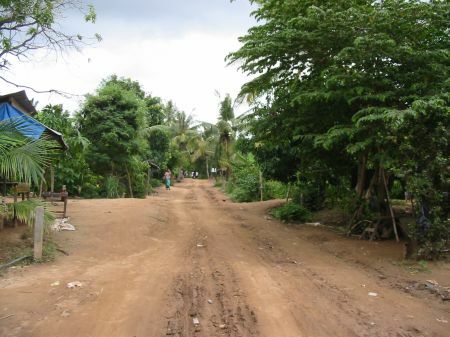 It became increasingly difficult to drive the moto with two people on this road. After we almost fell a few times and got pretty dirty we decided to continue walking. However, even that turned out to be quite difficult. Some villagers told us that the road is becoming worse further down the way. So we changed our mind and decided to drive back to the ferry and travel to another destination. This is when we pass the bridge on the way back. I felt sorry for those guys on the moto. They were just two as well but they had loaded their moto with huge sacks of something that seems to be quite heavy. After I saw the road a few hundred meters from here I do not think they will make it without falling and getting very dirty. 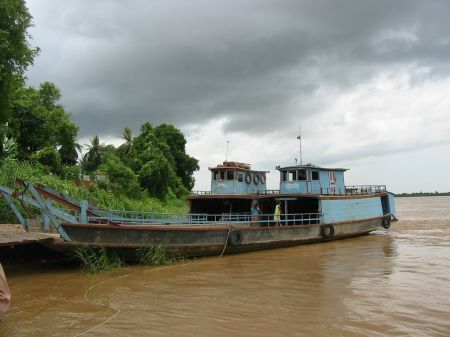 The ferry was at the other bank and we had some time to spend before we could pass the river. So we got us a soft drink at this place. We got into some conversation with local people. Later a woman appeared offering all sorts of hand woven scarves made of silk and cotton. I learned that making one scarf takes her about one week. Although I really do not have much use for it I bought a cotton one (3$) because I felt after she showed me all those products I cannot just refuse. My co-traveler is occupied with cleaning his clothes from the nasty ride. This is when the ferry finally arrives. 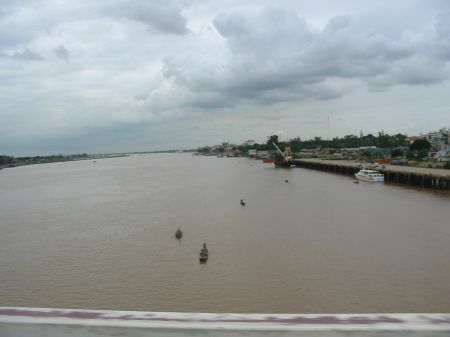 This is when we arrive back in Phnom Penh and pass the Japanese bridge. A number of speed boats are waiting at the bank. Those are the shacks of some fishermen. 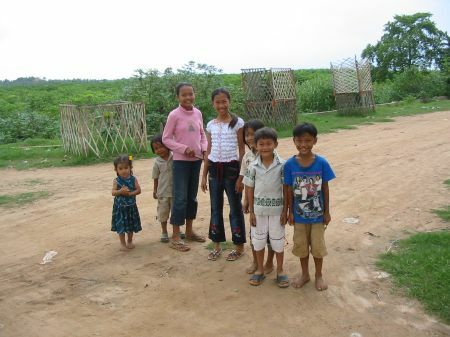 From what I have seen so fare those people are likely to be ethnic Vietnamese or Muslim Cham. 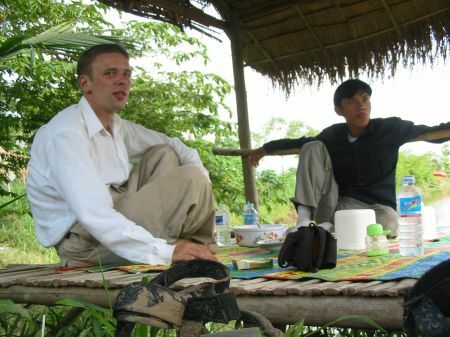 Since it was only early afternoon we decided to visit Kieng Svay as well. 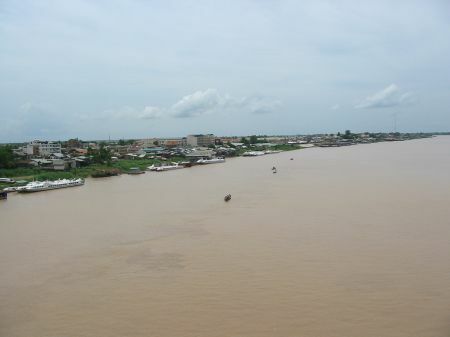 In order to do so we have to pass Phnom Penh and cross the Mekong again at the bridge in the south of Phnom Penh. 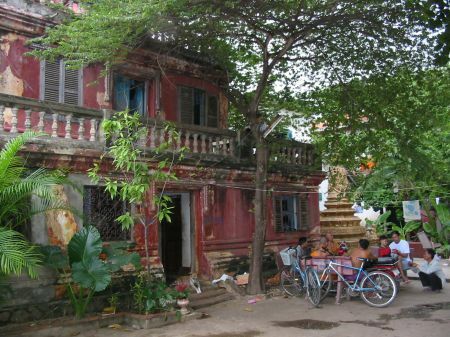 Kieng Svay is a place where mostly local people hang out for recreation. I have been there before, but alone and only for a short time. This is in front of Funcinpec headquarters. There are three boys of about 14 years traveling on a moto. This is quite a common sight. Frequently I see children (yes, girls as well) of hardly 12 years traveling with some routine and not exactly slow on all sorts of motos. This is how living chickens are transported. 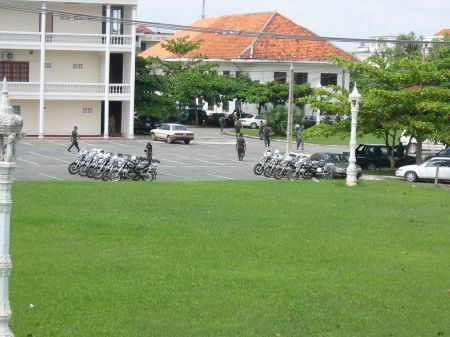 There is still significant police presence, here at Hun Sen Park. 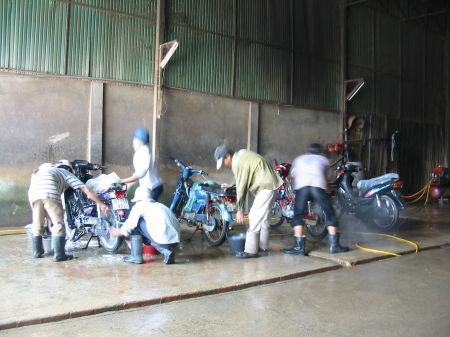 Since our moto was pretty dirty my co-traveler decided to give it a wash. We went to this place, where mostly women work really hard. The price for the quite extensive washing service is just about $0.125. 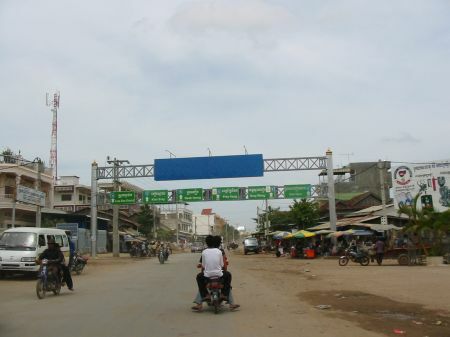 This is on national road number one with direction to Saigon. I provided a picture of this construction side earlier. This will be by fare the biggest pagoda I have ever seen. Finally we made it to this place close to Kieng Svay. 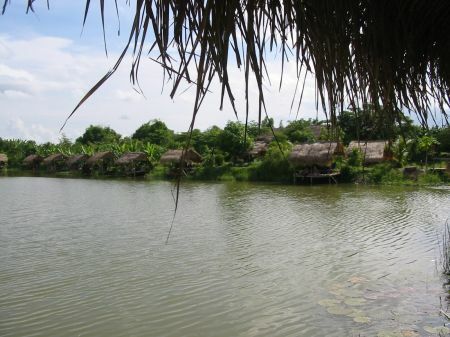 This is one of the recreation destinations for (better of) urban Cambodian people. There are beautiful flowers and plants as well as good numbers of all sorts of birds all over the compound. 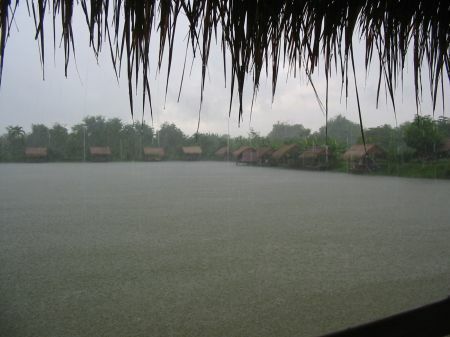 It is located about 20 km outside Phnom Penh. Families come here to picnic in those huts close to the water. Some people were fishing. For some reasons I liked the place. We spend about two hours and had some food. Than it started raining heavily. And there was no indication that the rain would stop anytime soon. We waited for quite some time. When it started getting dark and was still raining we decided to kick of and drive home. Co-traveler looks sort of tired for some reasons. However, it was not raining as bad anymore. I was lucky to sit on the back of the moto partly protected from getting wet by the back of the driver. This is Saturday. 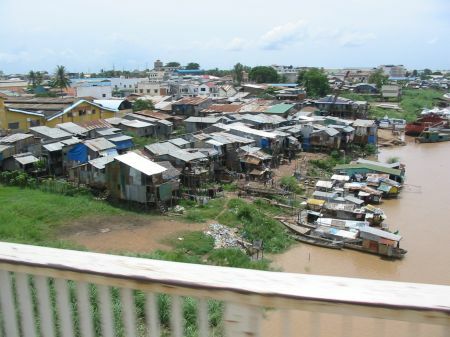 I went to see a few of all those Wats in Phnom Penh. One of the moto drivers gave me company. He studies tourism and appears to be well educated and interested. I though this is a beautiful temple. 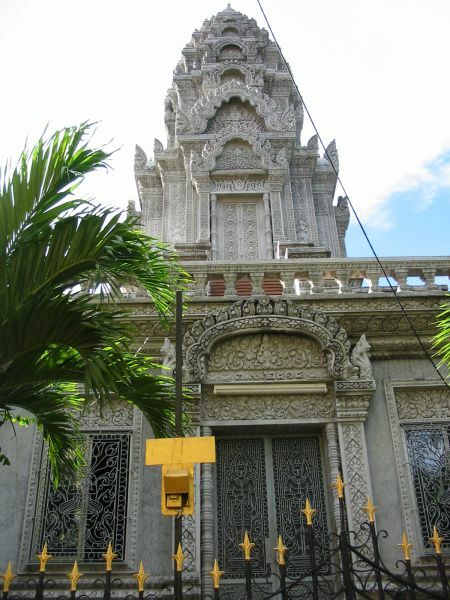 It belongs to Wat Sarawan, which was among the first five Pagodas in Phnom Penh. 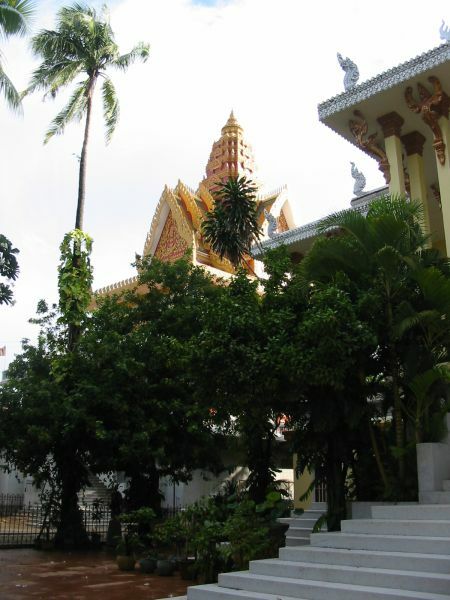 This particular temple is from 1936. 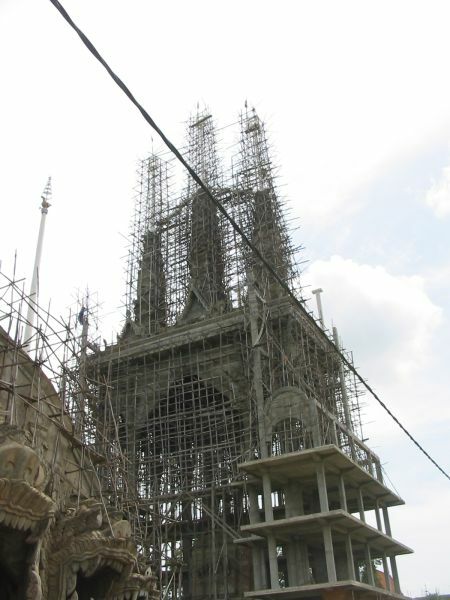 Unlike most major temples in Phnom Penh it is not yet renovated. However, it does not seem to be in a particular bad shape. However, my companion told me the head of this pagoda is sort of uneducated and wants to replace this beautiful temple with a modern concrete one. For a student of tourism this is irresponsible. I realized in many places that it is quite a common praxis to replace old temples. 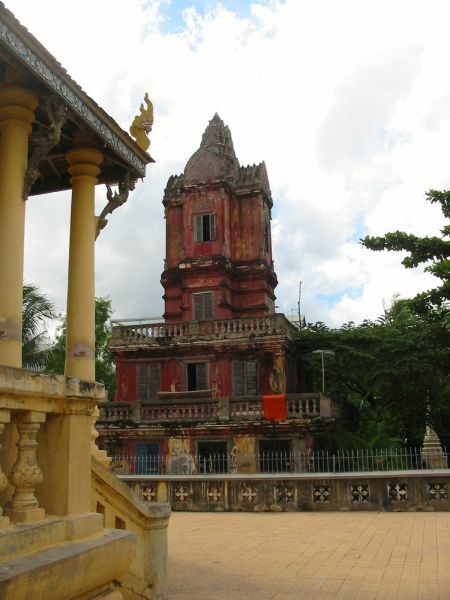 So it is not easy to find really old pagodas. I do believe many of those temples, among them this one, should be kept because they are bearers of history and cultural identity. 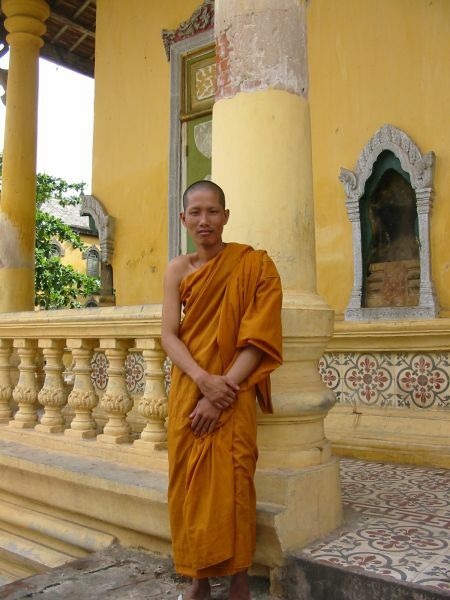 This monk was standing near the gate of the temple and my companion arranged for a short conversation. He is 30 years old and came two years ago from I forgot which province. 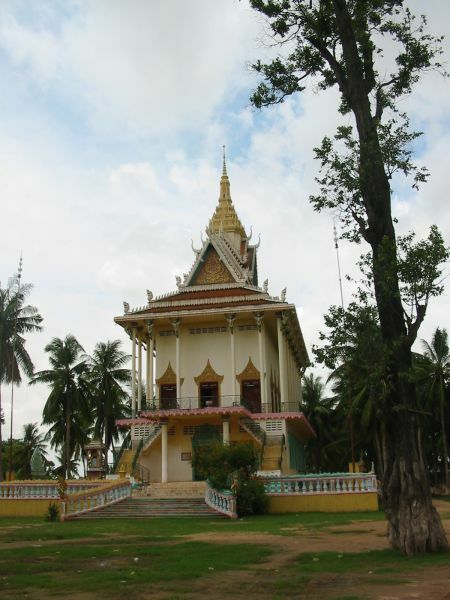 The pagoda gives him the chance to live in Phnom Penh and to study. What he studies is Pali and English. 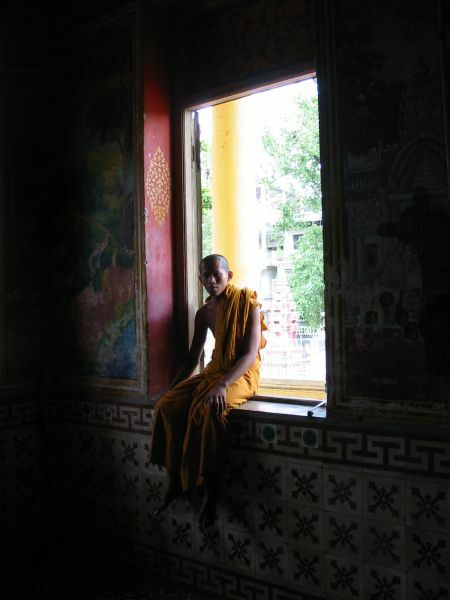 He smiled skeptically when I asked him whether he wants to remain a monk for all his live. He indicated that he would prefer a rather worldly career. 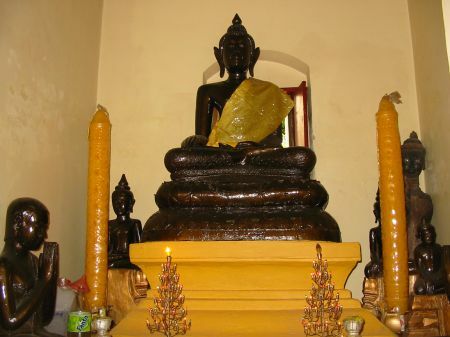 This is inside the temple. There are many Buddha all over the place. The structure is decorated with complex ornaments. 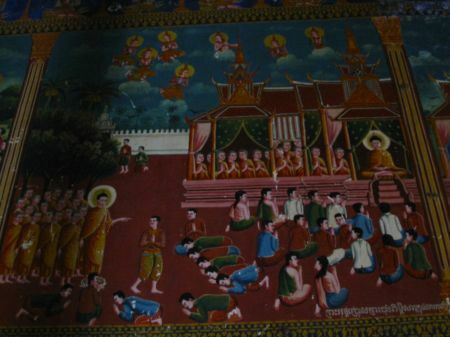 Walls and the ceiling are covered with paintings representing scenes from the live of Buddha. Some people where praying in the temple so I avoided using the flash. This is why I could not take pictures of those beautiful paintings properly. There was a group of monks sitting in one of the corners when we entered. This group did not exactly embody the persistent images of monks I have. One of them had fixed a hammock to the pillars, was laying in it and listening to pop music with his walkman. Apparently all of them had made themselves comfortable. I commented something like â€˜those are quite modern monksâ€™ which my companion felt free to translate. They found it funny. All of them were not even properly dressed, wearing only the bottom part of their robes. The guy in the window dressed up for this picture whereas the two other guys preferred not to be in the picture. I should stress that I do not want to spoil the images of Buddhist monks here. Rather I try to give an authentic picture of my experience. This stupa is standing next to the temple. 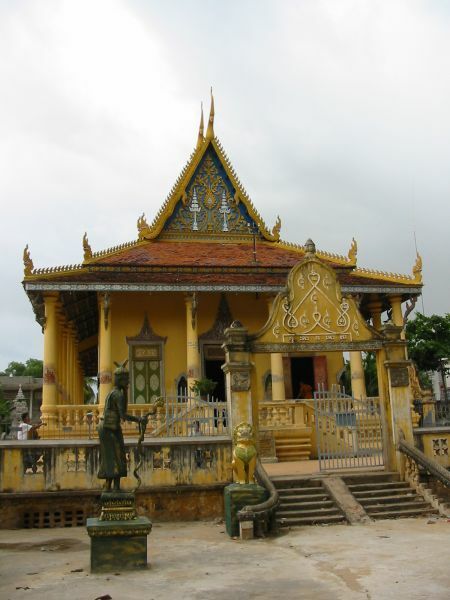 I learnt it is only since recently that the head of the pagoda allows monks to actually live in it. This is at the bottom of this stupa, where a group of people is having a relaxed discussion. Only about halve of them appear to be monks. After we visited this pagoda we went to the next one, which is close by Wat Ounalom. It was raining by the time we arrived. I mentioned earlier that my companions spend about 8 years of his live in a pagoda and it was in this pagoda where he has spent those 8 years. So he knew many of the people and the environment quite well. He introduced me to some monks. Because it was raining they invited me to join them in one of the many houses on the compound, which apparently serves as some kind of living room. There were a number of monks watching soccer on TV. However, not only monks, but some students as well. We got into some kind of conversations. The monks where sort of sluggish and it was not easy to keep it going. However, I asked some question about them being monks and got some interesting answers. Only one of them intended to remain monk for all his life. He does so because he thinks this is a good way of helping sinful people, promoting his religion, and developing the nation. When I asked him what he thinks about other religions and their members he told me any religion is valuable and helps people to act good. When I asked him how it is to live up to the strict rules that apply to monks he told me when he is bored of being a monk he quits for some time to do what he cannot do while being a monk. Since those monks were not very enthusiastic about conversation I ended up having a conversation with one of the pagoda boys. He is 19 years old, came from the countryside as well and studies English. His English really was pretty good, unlike the English of many people who claim to study English. 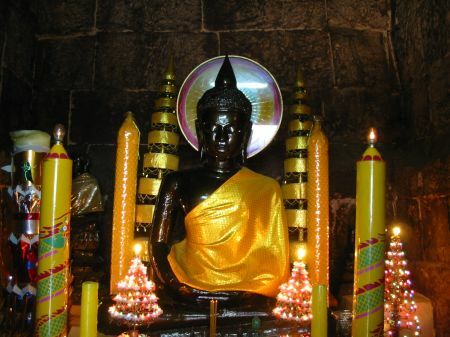 He pointed out that all those restrictions for monks do not apply to him and that he does not intend to become a monk. Interestingly, all of those monks and students had exercised their right to vote. More interestingly, the pagoda boy kept the secrecy of the ballot while the monks who did not pointed out that they voted for change and for Sam Rainsy. I was surprised because I heard earlier that monks are not supposed to be partisan. However, those young people appeared to be both knowledgeable about and interested in current political affairs to a high extent. Later another man arrived who was maybe 40 years old. He was not a monk and dressed rather like a clerk. I did not bother to start a conversation with him. I learnt that he is actually policy maker working at the Senate. This sounds better than it is because the Senate does not seem to have much influence in Cambodia. However, this guy is in touch with ongoing law making and turned out to be a very good chat. Quickly the current political situation became subject of this conversation. Nobody in the room seemed to be a strong supporter of a party other than Sam Rainsy. I asked the Senate person whether or not he expects violent demonstrations after the official result of the election is announced on August 8. Without hesitating he said yes. We spend quite some time elaborating on the options of forming a government right now, how likely an intervention of the king might be and how likely a three party coalition is. This seemed to become more interesting to the monks as well and from time to time one or the other of them participated. However, at this point boxing was in TV and some of them spend close attention. Later I learned that the Senate guy actually teaches law at more than one university and has a very good standing among the monks of this pagoda. And I learnt that he actually lives on the compound of the pagoda. Once again politics and religion appear to be closely tight to each other. I cannot present the entire discussion here. 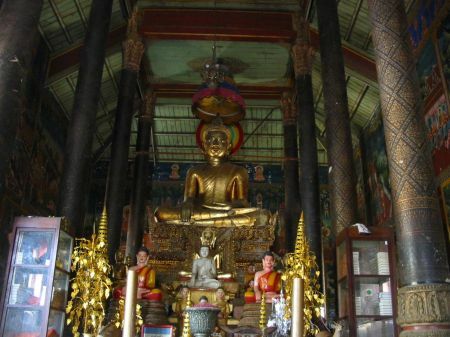 However I found most of those monks quite politicized and some pretty active in thinking about contemporary politics. All of them appeared to be rather skeptical of the current government. I start to understand that those wats are so much more than just physical structures housing meditating monks. 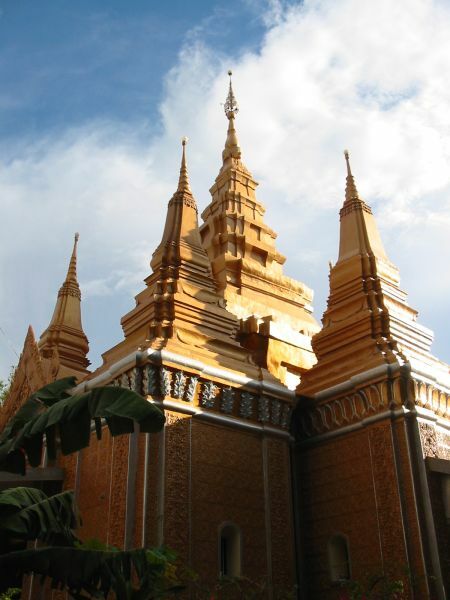 Many and diverse people live here and pagodas are in various ways influential institutions serving important purposes. Among others they serve as housing for poor university students. When the rain stopped we continued our tour through the compound of this pagoda. Unfortunately those monks did not want me to take a picture of how they spend their time in their living room. This stupa is said to house an eyebrow hair of Buddha himself. This might sound rather not very exciting. However, eyebrows seem to have some meaning among monks. Monks do not only shave their head but their eyebrows as well. From what I understand this is to abandon worldly enjoyments. 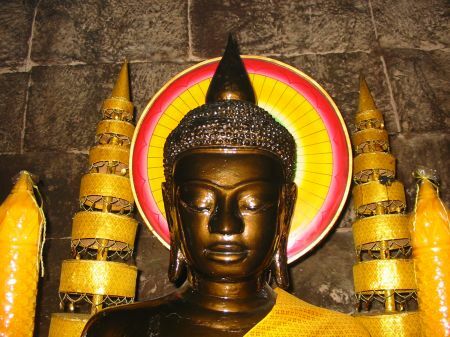 It is meant to prevent monks from looking handsome or in some ways attractive to women. Monks do not shake womenâ€™s hands. This is inside the stupa. Somewhere in here is the eyebrow hair but I do not know where exactly. The candles upfront are said to burn about 3 month. This is what appears to be some sort of halo. It is cheap electronic from plastic including tiny chains of lights which run constantly from the periphery to the center and back. In subtle and not so subtle ways the religious institutions in this country seems to be subject of significant changes. 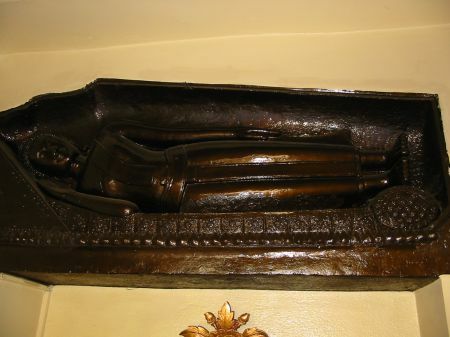 This is a laying Buddha above the door to this stupa. I learnt that it is old. This Buddha as well as the others in this stupa has been newly painted. This, however, seems to be subject of controversy. 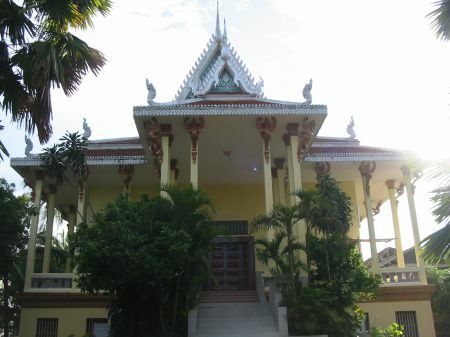 This building houses the head of Cambodiaâ€™s Buddhist hierarchy. I heard that his predecessors have been quite intelligent (â€œcleverâ€�) while he is not. This is a stupa next to it housing the remains of an earlier Patriarch. The roof in the background belongs to the main temple of this pagoda. 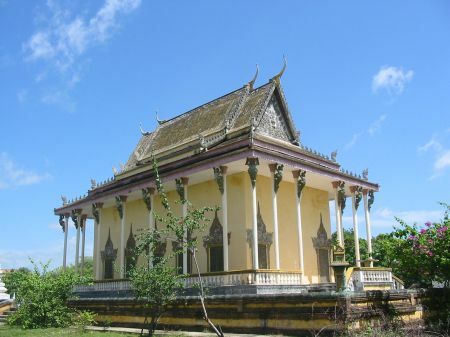 It has two stories and an â€œAngkor Wat styleâ€� roof. It is built in the 70s and not exactly a master. 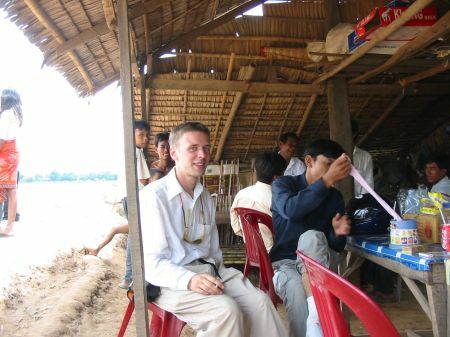 Afterwards we went to this Khmer place close to riverside to have some food. My companion is on his phone, which he holds in high regard. This article provides some information about the oppositions position. This article documents the position of the US towards Cambodia’s election and prime minister Hun Sen. I thought the following article published in the Asia Times on July 29 provides a good overview regarding the election in Cambodia and puts it into a meaningful context.